New Laser Interferometry Technique Developed at LANL Print E-mail A new laser interferometry technique has been developed at Los Alamos National Laboratory (LANL). 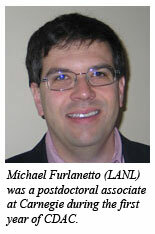 The project is led by Michael Furlanetto, a former Carnegie Postdoctoral Fellow. Michael received his Ph.D. in physical chemistry at the University of California - Berkeley and carried out interferometric studies of hydrogen at Carnegie. Shock experiments allow us to access high-pressure and –temperature states at very fast timescales. By measuring the velocity at which the shocked surface moves as a function of time, various conservation relations allow us to infer the stresses reached inside a sample. The details of these time histories can provide insight into material strength under extreme conditions, the presence, absence, and type of damage produced by the shock, and even the presence of small particles ejected from the surface by the shock. These velocity measurements are challenging experimentally: both velocities and accelerations are large – reaching kilometers per second or more for velocities – so fast time responses are required, while the violent nature of shock generation techniques severely limits the types of probes and techniques which can be fielded. Several years ago Ted Strand and his collaborators at Lawrence Livermore National Laboratory (LLNL) developed a new surface velocimetry technique known as Photonic Doppler Velocimetry (PDV). [Rev. Sci. Instrum. 77 083108 (2006)]. PDV is essentially a very fast Michelson-Morley interferometer, in which Doppler-shifted light returned from a shocked sample mixes with a reference beam to produce a beat frequency. Modern telecommunications equipment can measure this gigahertz beat frequency, and thus measure the velocity history of the sample surface. PDV is quite robust and easy to field, but the need for multi-gigahertz-bandwidth digitizers makes these systems somewhat expensive. In the last year a multi-laboratory team (from LANL, LLNL, and National Security Technologies) has developed the first MPDV systems. 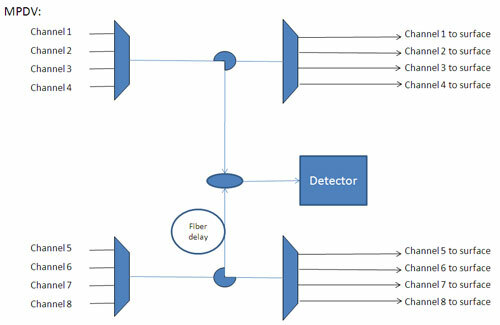 In these systems eight channels of velocity data are multiplexed onto a single recording channel. By frequency-shifting the reference light, four different signals can be offset in frequency/velocity space, and by delaying half of the signals through long loops of fiber, two sets of velocities can be recorded on the same trace. MPDV solves some of the practical problems – of money, space, power, and cooling – posed by fielding multiple conventional PDV systems. Also, by making vastly more channels available, it opens the door to new types of physics studies. With a hundred channels of data, spatial and temporal correlations in surface velocities can be measured in experiments with quite complicated geometries. The velocity history of each individual grain of a polycrystalline sample can be measured. Multiple angles of incidence can be used to measure the velocity field along several axes. The technological advances which enable MPDV also enable exciting new science.